In medical imaging, several authors have proposed to characterize roughness of observed textures by their fractal dimensions. Fractal analysis of 1D signals is mainly based on the stochastic modeling using the famous fractional Brownian motion for which the fractal dimension is determined by its so-called Hurst parameter. Lots of 2D generalizations of this toy model may be defined according to the scope. This lecture intends to present some of them. After an introduction to random fields, the first part will focus on the construction of Gaussian random fields with prescribed invariance properties such as stationarity, self-similarity, or operator scaling property. Sample paths properties such as modulus of continuity and Hausdorff dimension of graphs will be settled in the second part to understand links with fractal analysis. The third part will concern some methods of simulation and estimation for these random fields in a discrete setting. Some applications in medical imaging will be presented. 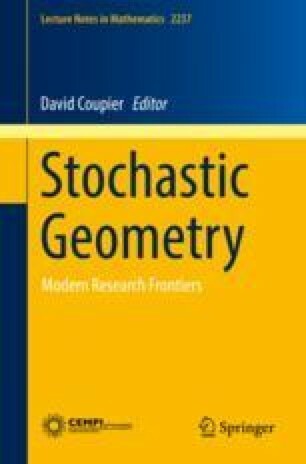 Finally, the last part will be devoted to geometric constructions involving Marked Poisson Point Processes and shot noise processes. I would like to warmly thanks all my co-authors for the different works partially presented here, especially Clément Chesseboeuf and Olivier Durieu for their careful reading.